Chelsea's Callum Hudson-Odoi applauds the fans after the Premier League match at Goodison Park, Liverpool. Martin Rickett/PA Wire. Chelsea have lodged a formal complaint with UEFA over racist abuse aimed at Callum Hudson-Odoi during the closing stages of the 5-0 Europa League win away to Dynamo Kiev. The Premier League club issued a statement on Monday highlighting the incident during the second leg on March 14, which did not name Hudson-Odoi directly. 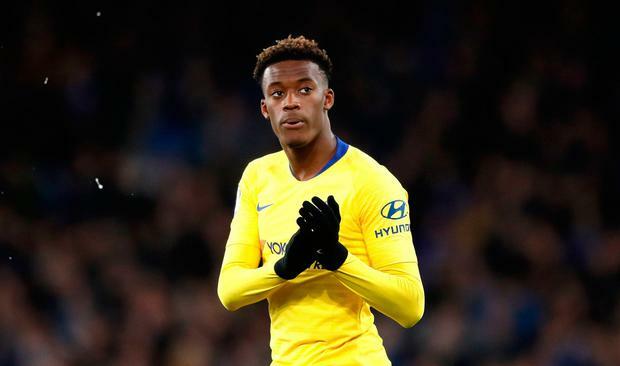 During the last two minutes of the match, winger Hudson-Odoi, 18, brought the incident - which Press Association Sport understands to have been monkey chants from a small group of 'ultras' home supporters in the corner of the end Chelsea were attacking - to the attention of team-mate Cesar Azpilicueta. A Chelsea club statement on Monday read: "We can confirm a report of racist abuse directed at one of our players in the final minutes of the match in Kiev from a small section of home supporters. We wholeheartedly condemn such abhorrent behaviour. With the matter included in both the referee's report and being highlighted to UEFA, the governing body is now set to investigate. It is understood Chelsea opted against issuing a statement on the evening of the match as both the club and player were content the matter was being dealt with correctly and taken very seriously by UEFA having gone through the correct channels. France forward Olivier Giroud had scored a hat-trick to set the Blues on their way towards a memorable away victory, with Hudson-Odoi also getting on the scoresheet during the 78th minute. Chelsea were later drawn against Czech side Slavia Prague in the quarter-finals.